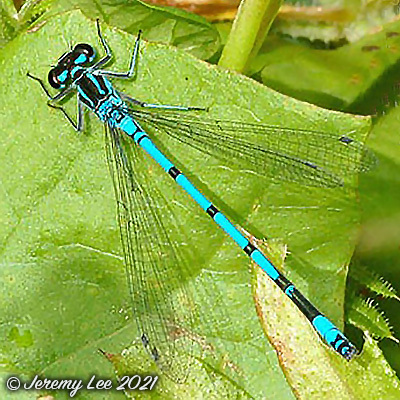 Adult male Azure damselflies have a head and thorax patterned with blue and black. They have an azure blue abdomen patterned with black markings. Adult female Azure Damselflies have a head and thorax pattern similar to that of the male, but with dull green replacing the blue colour. The abdominal segments are largely black in colour, with narrow pale markings at the junction between each segment. Mature adults are seen frequently mating and laying eggs. It usually stays close to the vegetation around the pond or lake and flies from May to September. This common Damselfly looks very like a Common Blue Damselfly, but a close look can distinguish between the two. The behaviour is also different - unlike Common Blues, they rarely fly out over large stretches of water. They are not normally as common around August and September, June and July being the peak of their populations.